Completed: Folding Club – February 2018 Amazon Smile Gift Card & Random BTC Raffles! Contest is now completed Shortstack Campaign. By joining Folding Club, you earn opportunities to win $25 Amazon Smile Gift Code^ Optionally you qualify for monthly BTC drawings (minimum prizes start at .003 BTC). Why we created Folding Club? Curecoin and Foldingcoin always welcome “citizen scientists” (like you) from around the world to “merge-fold” with us in order to help researchers while earning valuable CURE and FLDC tokens. As competition for our tokens rises, we realize users with low-power computers don’t often earn enough tokens to warrant the added effort. This is why we’re creating “Folding Club” – an incentive designed for all citizen scientists who want to contribute to scientific research and great charities, while still earning opportunities to win monthly prizes. Detailed Instructions Posted Below – Good Luck ! Follow our simple instructions on the Shortstack Campaign to enter our Amazon eGift raffle. Optionally add your bitcoin (BTC) receiver address in Shortstack to enter our monthly BTC drawings. These are required to enter this contest and future contests *don’t lose this passkey! 50% of CURE & FLDC tokens we collectively earn help select charities. Folding Clubs help balance the network to avoid “Folding Silos”; giving more citizen scientists “skin in the game” to enhance contributions to critical research like never before. Amazon Gift Card Giveaway and Group BTC Drawing for our Merge-Folders! Over 50 work units? We really appreciate your contribution in helping build our cloud and increasing charity funding. We deposit our 0.002 BTC on yabtcl.com, the 1st of every month that our club is active. We play 16 numbers, 0.00002 BTC drawings (playing 30 minutes per day on a “best effort” basis). If the club uses 0.002 BTC without any winnings, $25 (in BTC) will be still be awarded to randomly chosen club winner that month. 0.02 – 0.025 BTC, we give 90% to one lucky winner, and we retain 10% for project expenses. 0.025 – 0.03 BTC, we split 70% and 2x 10% between three lucky winners (club retains 10% per above). 0.03 – 0.04+ BTC, we split 50% and 4x 10% between five lucky winners (club retains 10% per above). If we win less than 0.02 BTC and we don’t lose the initial 0.002 BTC (account balance between 0.002 BTC and 0.02 BTC) the club will roll-over the balance to the next month. We always allocate a minimum of $25 in BTC prizes for one monthly winner. 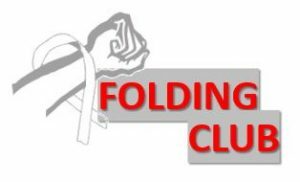 The Folding Club is currently reserved for the first 100 entrants. Only one email per social media account per BTC receiver please (no double entries … multiple entries will be automatically disqualified). * experienced participants can leverage their full [email protected] client, just temporarily change your username and passkey to run the required work units. ** Please check your local regulations on Bitcoin before entering. Unclaimed prizes will be donated to the Curecoin Project non-profit cloud merge-folding. In case of invalid Bitcoin addresses, winnings will also be donated to Cloud Folding. Data charges may apply when downloading the app – check your plan. ^ Amazon Smile is just like Amazon, only when “You Shop, Amazon Gives” a small donation back to Folding Club. 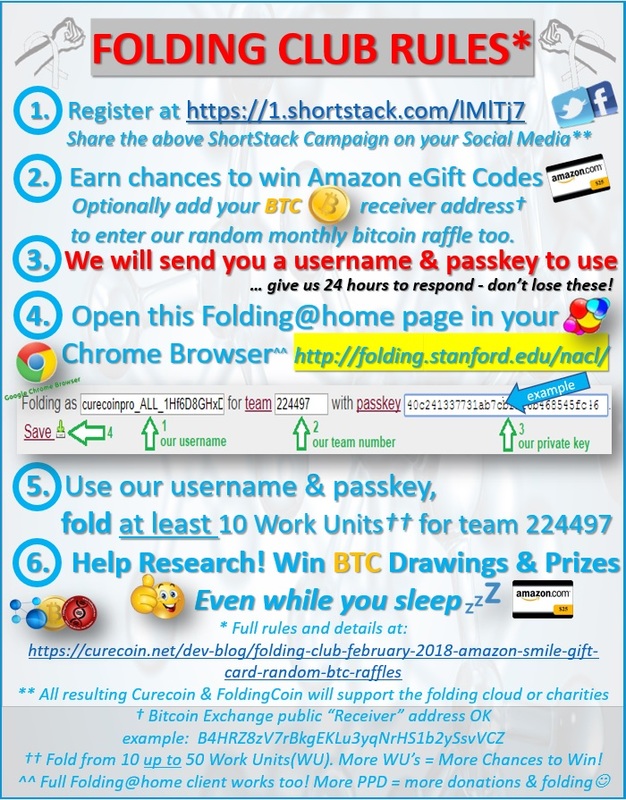 If, in the future, you would like contribute to Stanford folding research philanthropically, or earn your own Curecoin and Foldingcoin, we recommend you create your own passkey and follow merge folding instructions on either curecoin.net or foldingcoin.net websites.